Well, now that I've got an essay out of the way, I can get back to blogging properly for awhile, I hope. I've managed to cover a goodly chunk of the UK this month. First off, I was in London November 4-6 for the purpose of attending the Reimaging the Brontes conference put on by the University of Warwick and hosted at the Senate House Library of University College, London. What a lovely, and gigantic building! I didn't take a picture, alas. Our lovely friend "London Katherine" kindly hosted me in her student flat and we, along with another visiting friend, did a nice walk along the Thames on Friday night and then explored Spitalfields Market on Sunday morning. I got a sweater with cats on it. The conference itself was really great, though I was mentally exhausted by the end of it and had a giant nap after dinner. I also discovered that there is apparently much more to be said about the Bronte juvenilia, which makes me a happy academic, since this is what the first chapter of my dissertation is going to cover. Also related to the Bronte juvenilia, a previously untraced and unpublished Charlotte Bronte manuscript has turned up and is going to be auctioned off by Sotheby's next month. It's expected to fetch 200-300 k quid. Yikes. The Bronte Parsonage Museum Library has put out an appeal for funds, in order to make a bid for the manuscript, which is the previously missing second issue of Charlotte's The Young Men's Magazine. These magazines were written in miniscule print and were very small, originally toy-soldier sized. I really hope a library, preferably one in the UK gets this, because I would love to go have a look at it. If it disappears into a private collection again, it would be much more difficult for scholars to get access to it. 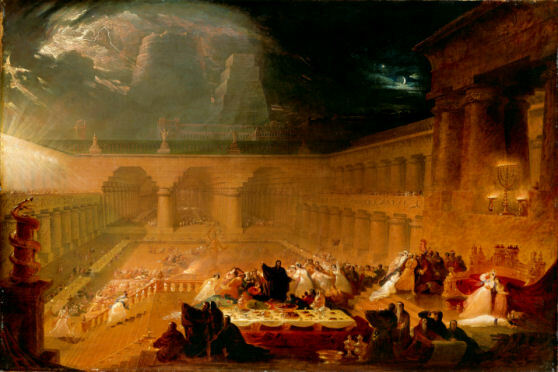 On the Sunday, Tim came down on the train and we went to the John Martin: Apocalypse exhibition at the Tate Britain (which was a bit pricey, but worth it). 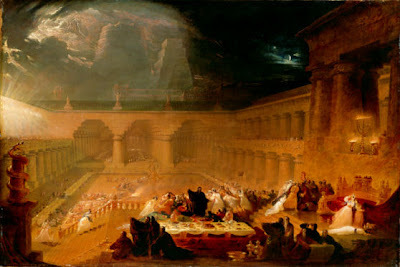 John Martin was often seen as a popular painter and wasn't necessarily taken seriously by the artistic establlishment for his blockbuster, sublime paintings of biblical and classical scenes, often of destruction. He was better known for the innovations he made in the art of engraving. The Brontes are known to have had at least 4 of his prints in the house, some rather large and therefore expensive. Charlotte's visionary scenes and grand city-scapes could definitely have been inspired by his art. We also visited the Natural History Museum and the Victoria & Albert Museum and then we headed home.